Originally published under the title "Turkish Procurement Saga Weighs Russian S-400 Deal against Pleasing the West." Turkish officials have given conflicting statements on whether they are negotiating to directly purchase or to coproduce Russia's S-400 air defense system. ANKARA, Turkey — The past couple of weeks have seen a thick layer of fog surrounding Turkey's controversial, multibillion-dollar program for the procurement of the country's first long-range air and missile defense shield. 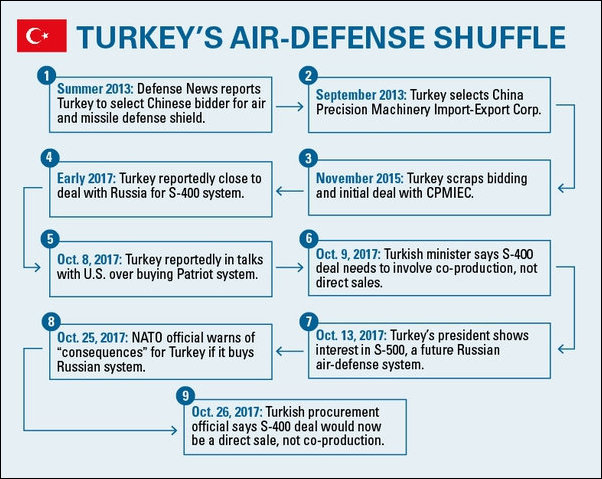 There have been contradictory official statements reminiscent of confusion in the summer of 2013 when a Defense News story claimed that Turkey would select the Chinese bidder in a four-way competition (against U.S., European and Russian rivals). Three months after that story, in September 2013, the Turkish government announced that it selected China Precision Machinery Import-Export Corporation for the program. In 2015, Turkey scrapped the bidding and an initial deal with CPMIEC. And in early 2017, Turkish officials said they were close to a deal with Russia for the procurement of the S-400 system. Turkish President Recep Tayyip Erdoğan said Oct. 13 that Turkey was also interested in acquiring a future Russian air and anti-missile system, the S-500 — which is under development. "In our talks with [Russian President Vladimir] Putin, we are not thinking of stopping with the S-400s. We have had talks on the S-500s, too," Erdoğan said. But according to Turkish Foreign Affairs Minister Mevlüt Çavuşoğlu, the S-400 deal involved joint production, not direct sale. "If Russia doesn't want to comply, we'll make an agreement with another country," Çavuşoğlu said Oct. 9 following reports that Russia was reluctant to share the technology. Just a day before that, on Oct. 8, a senior opposition politician who had visited Washington said Turkey had contacted the U.S. with the intention of acquiring the Patriot system "two to three weeks ago." He said he was briefed on the discussion by U.S. officials. A top Turkish procurement official who is part of the S-400 negotiations said Oct. 26 that talks with the Russians have successfully progressed and are about to be completed. "There is agreement on every technological issue," he said. "Negotiations are progressing further. The two sides are now discussing financing for the program, with a few technical details remaining to be agreed upon. They concern the terms of financing." He said the S-400 deal would be direct acquisition, not co-production. He also said that a future co-production deal for the S-500 system was unlikely because Turkey also had selected a foreign partner for its indigenous air and anti-missile architecture. Talks with the European Eurosam group have been progressing since 2016 for the co-production of the SAMP/T system, designed for medium- and long-range air defense. "Eurosam will sign a contract with two Turkish companies for the co-production program later this year, probably quite soon," the official said. The two Turkish prime contractors are state-controlled military electronics firm Aselsan, Turkey's largest defense company, and missile-maker Roketsan. 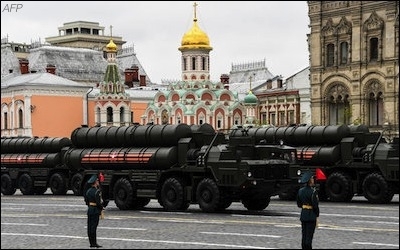 Czech Gen. Petr Pavel warned last month that Turkey's purchase of S-400 system would preclude Ankara from being part of any integrated air-defense system with NATO allies. If NATO-member Turkey signs up for the S-400s, it will have signed an air-defense deal with two non-NATO countries in the span of four years. A top NATO official has warned of "necessary consequences" for Turkey should the alliance member purchase a Russian air-defense system. Political analysts anticipate Ankara will come under pressure from its NATO allies. 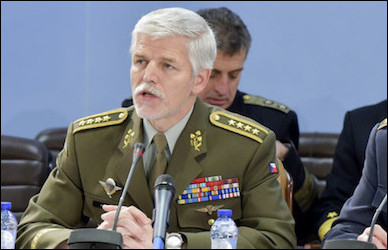 Gen. Petr Pavel, chairman of NATO's Military Committee, recently said that while each nation is free to make its own defense decisions, Turkey's planned buy of the S-400 system would preclude Ankara from being part of any integrated air-defense system with NATO allies and may result in other technical restrictions. "The principal of sovereignty obviously exists in acquisition of defense equipment, but the same way that nations are sovereign in making their decision, they are also sovereign in facing the consequences of that decision," Pavel told a group of reporters at an event hosted by the Defense Writers Group.